JERUSALEM--Benjamin Netanyahu sounded a confident note at the official launch of his re-election campaign last week, but to anybody who’s been watching Israeli political developments, it’s clear that with three weeks until Election Day, the prime minister suddenly has reasons to be fearful. Not for his job, of course—Netanyahu’s hold on the premiership remains unchallenged—but of the headaches he is suddenly likely to face as he assembles his next governing coalition. Initially, the gambit appeared to be paying off. Even after the Likud’s Tea Party-esque primary results last month, "Likud Beiteinu" looked set to duplicate or surpass the 38 seats former Likud prime minister Ariel Sharon won in 2003, at the height of the Second Intifada. But in recent weeks, the alliance has steadily hemorrhaged support, and it’s not clear that the bleeding has stopped. Three polls published last week had the list at 34 seats, and another had it down to 33—still nearly double that of the nearest competitor (the center-left Labor Party), but nowhere near the 42 seats the parties currently hold or the 45 forecast by the merger’s mastermind, American political consultant Arthur Finkelstein. (It wouldn't be Finkelstein’s first failed prophecy. Netanyahu was reportedly shocked by the U.S. election results after Finkelstein predicted a four-point Romney victory). The second factor behind Likud Beiteinu’s slippage is the rise of Naftali Bennett, the charismatic 40-year-old leader of HaBayit HaYehudi (“The Jewish Home”), the political home of Israel’s national-religious camp. The party, which enjoys strong backing from Jewish settlers in the West Bank and their supporters, is running on a joint list with National Union, the other major pro-settler party. 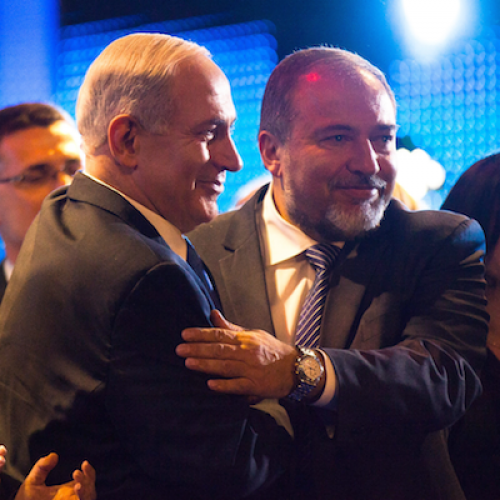 It has only three seats in the outgoing Knesset, but gained much support last month due to right-wing dissatisfaction over Netanyahu’s quick ceasefire with Hamas (Bennett had called for a ground invasion to topple the Hamas government). Likud Beiteinu’s towering lead over its rivals, as well as Bennett’s promise to join a Netanyahu-led government, also seems to have given many right-wing voters the luxury of supporting their first choice (in the same Haaretz "Who do you trust?" question, Bennett scored 14 percent--just six points behind Netanyahu).